I have to admit that I'm no fashion guru... So when I heard that Lancôme was collaborating with Proenza Schouler for fall 2018, my first thought was "Proen... who?"! 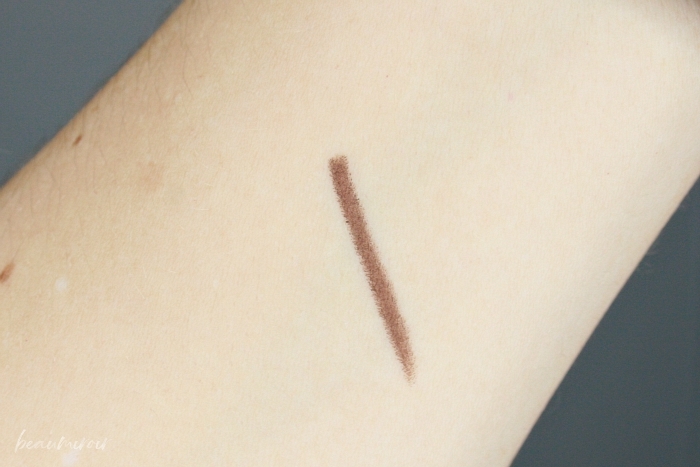 I still bought a piece from the collection: the Ombre Hypnôse Kajal Chroma in Minimal Brown. Keep reading to find out what it is! Back to Proenza Schouler for a moment: it's a successful American fashion brand based in NYC and created in 2002 by two young designers who named it after their mothers' maiden names. So no, it's not a person as I thought, haha! The fall collection Proenza Schouler made with Lancôme includes two eyeshadow palettes, classic lipsticks, lip duos with a kajal crayon and a gloss, a burgundy mascara, nail lacquers, and the eye kajal that I bought. "What is an eye kajal??" you might be wondering. The word "kajal" comes from South-East Asia, but it is also known as kohl or khôl in the Middle East and North Africa, and sürme or surma in other parts of the world. It's a traditional type of eyeliner that has been used since ancient Egypt - so nothing new here. It can come in the form of powder in a vial with a thin stem to dip in (Guerlain currently makes one like that), or a tapered stick that is wide at the base and pointy at the end, like Lancôme's new Kajal Chroma. To be fair to the brand, the creamy texture of the Kajal Chroma makes it easy to smudge and blend for a smokey lash line or an all over wash of color on the lid. If you like a blurry ring of a deep color all around your eyes to make them look brighter and sharper, this product makes it super easy to achieve. It's very pigmented, applies like butter on the skin, and it doesn't flake, skip or look patchy when blended. Let's talk about the shape of the Kajal Chroma. I really like the design that Lancôme created, as the pen body with a sharp pointy end echoes the pointy liner stick. I think it's very elegant - is this high end stationary, a fancy cigar holder or makeup? But it's also practical to use. The long "handle", for lack of a better word, fits well in my hand and makes the liner easy to maneuver. I've owned kajals in the past that twisted out of chubby round boxes and they were a pain to use. Only downside, I've got to be very careful when I place the cap back on because it's really easy to nick the product (already happened twice...). If you've never had a kajal, you might wonder how you're supposed to use this thing. 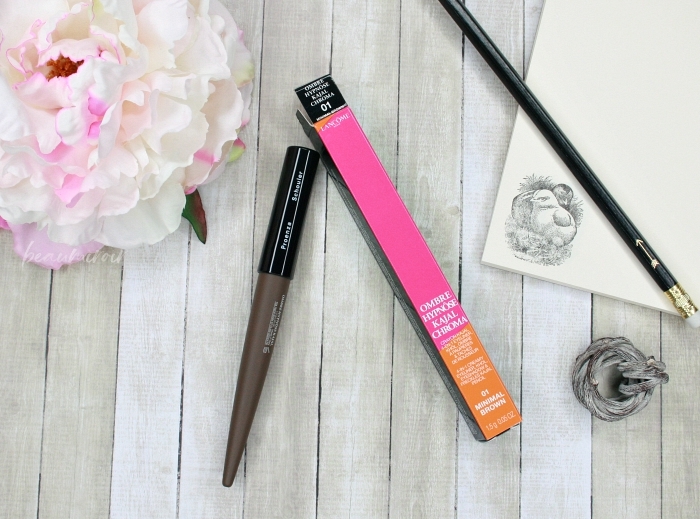 As tempting as it is to use the pointy end as a pencil liner, it's made to be used sideways. I mean, you can do whatever you want with it as long as it works for you, but you'd get a blunt point very quickly! 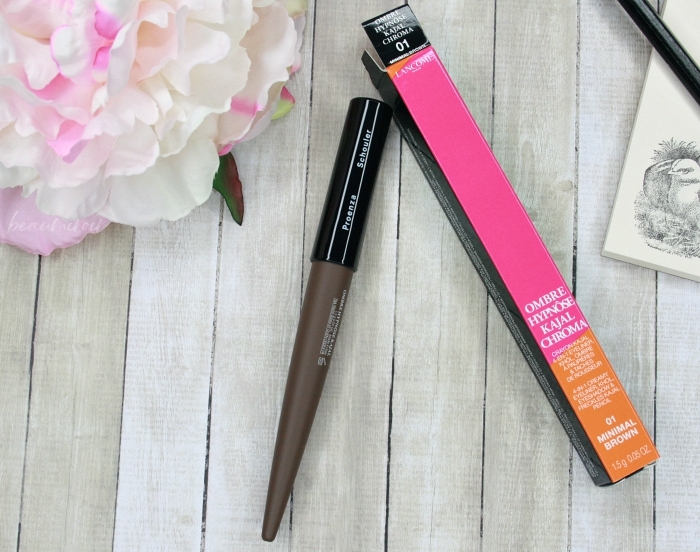 I mostly use the Kajal Chroma to line my waterline, both upper and lower, and here's how I do it: I place the stick sideways on the waterline starting at the inner corner and gently pull outwards. Then I go back, still holding it on its side, on any area where I want more intense color. I have sensitive, allergic eyes that can get very red and water a lot, and I wear contacts. I've never had a problem with this product bothering my eyes or making my contacts blurry. Whenever I'm want it on my lash lines, I also apply the Kajal Chroma by pulling it along my lashes sideways, then blur using a short blending brush with medium density. I really like the smokey, smudgey effect! It's obviously imperfect - that's pretty much how blurred kohl is supposed to look - and I love a good imperfect look these days. Take that society with your expectations for women to look flawless! Wear time is good for a kajal/kohl, but by nature it is prone to moving or smudging a bit, especially in the beginning. On my waterline it starts to disappear after a few hours, which is annoying but better than most pencil liners. I found that powder (a dark eyeshadow or a powder kohl) is what lasts the longest on my waterline anyway. I love the beautiful design of the Kajal Chroma, and I really enjoy using it to create smudged smokey looks. 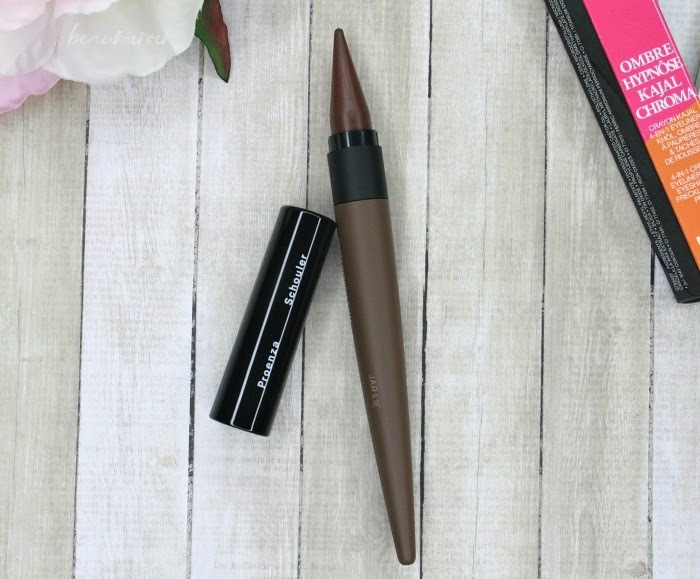 I think it's pretty foolproof if you're tempted to try your first kajal, as it is so easy to blur and blend. The product featured in this review was purchased by me. I received no compensation to write this post, which only reflects my personal opinion. This post contains affiliate links. I receive a very small commission when you shop through those links, and the money generated covers a small portion of my expenses to purchase products for review. Clicking on those links helps ensure that Beaumiroir continues to publish reviews of new and exciting high end French products - at no cost to you!